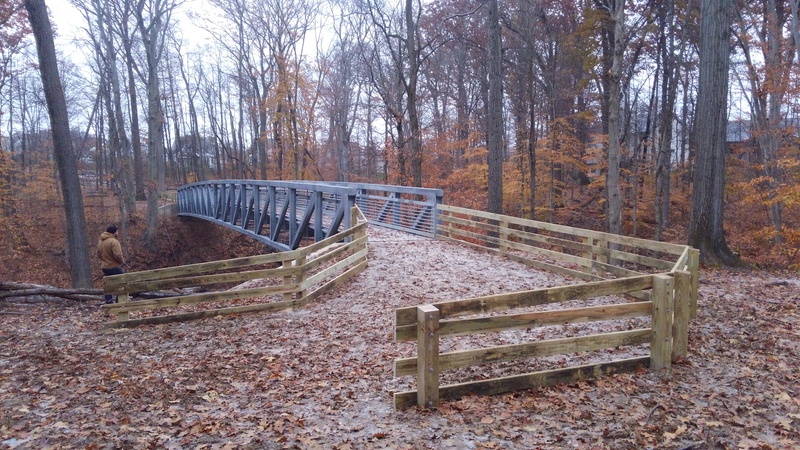 The portion of the Carriage Trail connecting the end of Holzhauer Road to the Towpath Trail in the valley is now officially open to foot and bicycle traffic. Regarding the rest of the Carriage Trail, the middle bridge has been replaced with a new bridge. However, the other two bridges are now gone and therefore that portion of the Carriage Trail (shown in Red on the Map) is still officially closed. However, the Hemlock Loop portion of the Carriage Trail (shown in Green on the Map) connecting to the Greenwood Trails at each end of Hemlock Lane (shown in Yellow) is open to hiking, and also provides hiking access to the Towpath Trail. Please enjoy these trails until the full Carriage Trail is completed and reopened. NOTE: The re-seeded temporary access route at the end of Woodbridge is private property, please do not trespass. These residents graciously allowed the Park to go across their yard to replace the bridge. 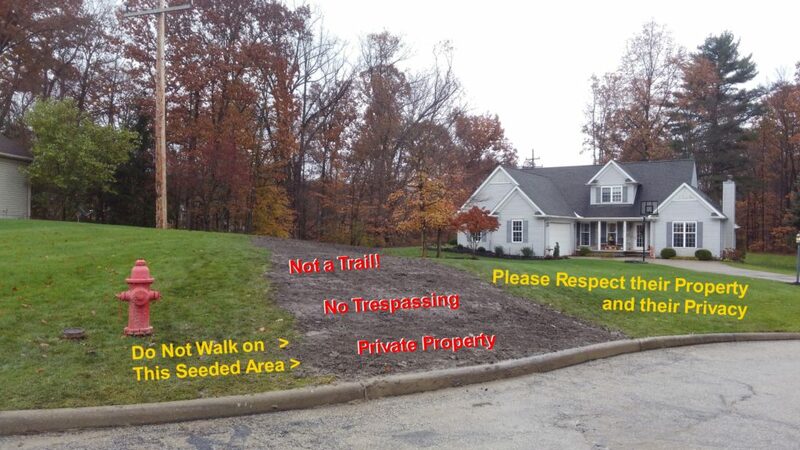 You can say thanks by respecting their property and their privacy by not walking on their yard and not killing the new grass. If you are really curious what the new bridge looks like, please do not try to go there. Just click here for a picture. To see the trail map below at full size or print it, please go here. There is No Access to the Carriage Trail through Woodbridge!